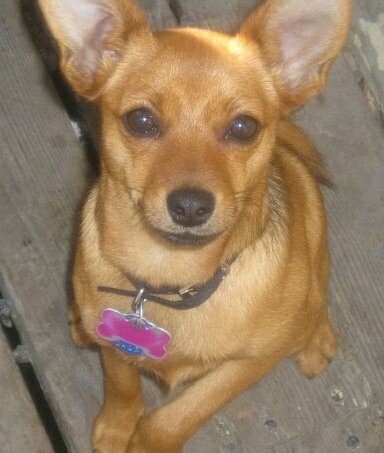 "Scully is a Pineranian shown here at 8 months old. She lives in BC Canada. She loves going to the beach and playing with other small dogs. She is daddy's girl even though she was mommy's birthday present. She loves sleeping on or under soft blankets.". The Pineranian is not a purebred dog. It is a cross between the Miniature Pinscher and the Pomeranian. The best way to determine the temperament of a mixed breed is to look up all breeds in the cross and know you can get any combination of any of the characteristics found in either breed. Not all of these designer hybrid dogs being bred are 50% purebred to 50% purebred. It is very common for breeders to breed multi-generation crosses. "These are my first batch of puppies. Their mother is purebred Min Pin and the father is Pom. She had eight in total; only seven survived. The puppies are 6 weeks old in this pic and just had their first shots. Cutest little things. Very good temperament.". Pineranian (Min Pin / Pom mixed breed) puppy; see the rest of the litter below. Pineranian (Miniature Pincher / Pomeranian cross) puppies at 4 ½ weeks—their mother is a purebred Miniature Pincher, and their father is a purebred Pomeranian. There are eight in the litter, all are either tan, or black with tan points like their mother, in fact the breeder says she ended up with four tan, and four black with tan points! Some are built like the Pomeranian, and some are built like the Miniature Pincher. These three are the pick of the litter for the breeder, in fact they are so irresistible that she says she is keeping the tan one that is Pomeranian looking; her name is Tetie.